Using a Heatmor stainless-steel outdoor furnace is a cost-effective way to heat your home, garage, shop, pool or spa. 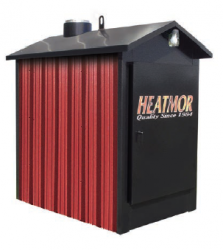 Built from 409-gauge stainless steel and backed by a limited lifetime warranty, Heatmor furnaces provide a safe, economical and convenient way to burn wood, coal, pellets or used oil. Heatmor™ began producing outdoor furnaces using Type 409 Stainless Steel in 1994. All furnace components that come in contact with fire or water are manufactured using Type 409 Stainless Steel. Prior to 1994, Heatmor™ manufactured outdoor furnaces using carbon steel. Heatmor™ chose to begin using Type 409 Stainless Steel due to its improved oxidation and corrosion resistance versus carbon steel. Heatmor™ found that outdoor furnaces manufactured using Type 409 stainless Steel would last approximately three times longer than furnaces manufactured using carbon steel. According to 82 percent of our customers, stainless steel construction proved to be the number one reason why they purchased a Heatmor outdoor furnace. Having water thermo-siphon through the Heatmor™ fire door virtually eliminates door warpage, important in keeping an airtight system. Using a water-cooled door improves the efficiency of the furnace because it increases the heat transfer area used to pull heat from the fire. The Heatmor™ has an over/under Forced Air Draft system that blows air above and below the fire. Forced draft furnaces have better heat recovery ability when compared to naturally aspirated furnaces. Forcing air onto the fire in the right places will generate a hot fire faster than a natural draft system. Forced draft will also burn larger wood more efficiently. The forced draft feature was the reason 52 percent of our customers purchased a Heatmor™ outdoor furnace. The bladder allows the Heatmor™ to be a semi-closed system, which will reduce evaporation and pressure buildup in the system. Because the bladder system holds the expanding water when heated, it reduces the need to add water. When you add water to the system, you also add contaminants, increasing the chance of rust and corrosion. The bladder is meant to increase the life of your furnace. The Canadian Standards Association (CSA) is a first class test certifying body that symbolizes the safety of products. Most insurance agencies require the product be CSA listed to be insured. The Heatmor™ is CSA approved in the USA and Canada, which shows the quality and credibility of the product. See the Heatmor™ certified product listing at www.csa-international.org. The Heatmor™ is considered an open-bottom furnace. The bottom of the furnace is the most corrosive part of wood burning furnaces due to the collection of acidic ashes. In order to combat the corrosion issues in the bottom of furnace, Heatmor™ utilizes sand surrounded by firebrick. The firebrick allows the fire to reach higher combustion temperatures in order to facilitate a more complete burn. Additionally, the mass of firebrick and sand allows for a heatsink which gives off heat during the shutdown period of the burn cycle (when your furnace’s water temperature is satisfied). The grates and ashpan are nestled in the sand to allow for easy ash removal without disturbing the burn. The ash auger is a tool used to remove ash from the rear of the Heatmor™ furnace. This makes for a more convenient and easy ash removal. There is no need to let the fire burn out to remove the ashes nor any need to shovel the ashes out the front door. Almost 50 percent of customers mentioned the ash auger system as a reason they chose Heatmor™. The Heatmor™ is insulated with fiberglass bat insulation, the same as used in insulating homes. The sides of the Heatmor™ are insulated with R-19 and the top with R-38. The insulation is non-flammable, easily accessible, long lasting and assists in the creation of a well-built efficient furnace. The Double Door feature allows preheated air to be drawn into the over/under Forced Air Draft system, increasing the efficiency of the burn. The lockable outer door on the Heatmor™ provides an important safety feature, keeping children and unwanted guests out of the furnace. 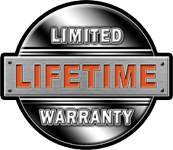 Our limited lifetime warranty which covers defects in materials as well as both corrosion and workmanship is by far one of the best in the industry. Because we have such great confidence in our product, we are able to offer you one of the most comprehensive warranties in the industry. The key to researching warranties is reading the fine print. (Complete warranty details at www.heatmor.com). The lower nine inches of the firebox is lined with two-inch thick firebrick. There are several reasons for this. During operation, the firebrick will achieve temperatures in excess of 800 degrees Fahrenheight. During the shutdown cycle, these hot bricks will evaporate condensation.The firebrick is placed in the most corrosive area of the firebox, below the ash line. Therefore, it is not necessary to scrape the corners and look for corrosion. The firebrick will retain heat during shutdown. This, along with the forced draft system will re-ignite the fire quicker. The area lined with firebrick will achieve a higher temperature during the burn cycle to allow a more complete burn. Heatmor™ offers a variety of options to make the Heatmor™ appealing to all consumers. 18 attractive color options to choose from at no extra charge. Internal domestic water coil for on demand hot water. Shaker grate system to burn certified types of coal. Pellet Burner A Heatmor™ that burns pellet wood. Used-Oil Burner A Heatmor™ that burns both wood and used-oil.